Teenage Mutant Ninja Turtles (2003) season 2, part 5 review – AiPT! We review the final five episodes of “Teenage Mutant Ninja Turtles” (2003) season 2. The timing on this article couldn’t be more perfect (entirely by coincidence), as the Teenage Mutant Ninja Turtles and Usagi Yojimbo franchises are currently enjoying another multimedia tie-in spree. The Nickelodeon TMNT cartoon just wrapped up a three-part crossover story arc between the TMNT and Miyamoto Usagi, there’s an expanded TMNT/Usagi toyline hitting the shelves, and IDW just published a TMNT/Usagi Yojimbo one-shot special comic. Yep, right now the Turtles and Usagi are going together like bread and butter. But what about the LAST time they hung out? While visiting a comic shop in Northampton, Michelangelo discovers that his favorite superheroes, the Justice Force, are REAL! The Turtles and Casey are soon caught up in the action, as the ex-JF member, Dr. Dome, returns for revenge. Alright, I know I kinda shat on this episode in the intro, but it’s actually a very good and faithful adaptation of Peter Laird’s TMNT (Vol. 1) #15. The problem is that TMNT #15 was never one of my favorite issues and the recurring Justice Force characters were never any of my favorite familiar faces. Your mileage may vary, assuming you like the Justice Force guys (do such people exist? ), but this one wasn’t for me. In regard to “faithfulness,” this adaptation actually fixes some of the problems with the original story. In the Mirage version, the Justice Force were supposed to have operated in secret, with their comic book being a biography of their adventures that everyone thought was fake (or so the setup was). But then midway through the issue, when the Turtles get to Steve’s mansion, he explains that he became a millionaire making public appearances and collecting licensing fees, acting like the Justice Force and their exploits were all public knowledge. It never quite fit together, so the cartoon version cuts out the “licensing” thing and keeps their existence a secret to the public. This also leads to the exclusion of one Justice Force member: Captain Deadbolt. He was a knock-off of the Thing who got frozen in a “Stayin’ Alive” position while dancing at a disco. Since this version had to keep the Justice Force out of the public eye, Deadbolt was dropped (and he only existed as a quick sight gag in the comic, anyway). The remaining members of the Justice Force are Stainless Steve Steel, Zippy Lad, Joey Lastic, Metalhead (the robot dwarf, not the robot Turtle) and the late Battling Bernice. Several of them would go on to be recurring characters in the Mirage comic during the Volume 4 period, though, they never contributed all that much to the narrative in the long run. They won’t do much here in the 4Kids series, either, though the legacy of the Justice Force name will be passed on to the other superhero characters who have been appearing, and will soon appear, in the cartoon. So this episode does leave something of an impact on continuity. It also TRIES to leave an impact on the toy shelves, but I don’t think it quite hit the mark. The episode opens with Donatello revealing that he has built color-coordinated Shell Cycles for all of the Turtles, not just Raphael, and they use the bikes (with accompanying sidecars) throughout the episode. I don’t believe Shell Cycles were ever released in any color other than red to align with Raph, making this yet another promotion for toys that don’t exist. Man, season 2 has been really bad about that. And many of the toys they’ve promoted this season that made it to shelves wound up looking nothing like the designs in the show. I guess this was a bad year for cartoon-product synergy. Getting back to “faithfulness,” I should actually stop using that word, because writer Marty Isenburg completely changes the original ending. But you know what? It’s a 110% improvement over what Laird had written. In the comic, Dr. Dome was behind all the attacks on the Justice Force, wanting revenge for the fact that the departed Battling Bernice had chosen to love Steve over him. Bernice’s daughter, Ananda, arrives and helps the JF defeat him, but Steve decides to give Dr. Dome the chance to make amends. The episode goes in a completely different direction. Dr. Dome shows up, but thinks that Steve is the one who has attacked the rest of the JF and they wind up fighting each other. Ananda then arrives and is revealed to be the evil mastermind. Being the daughter of Bernice and Dome, she blames the JF for her mother’s death and coordinated the attack to turn them on each other. The Turtles defeat her and she ends up coming to terms with her estranged father. It’s a much more involved scenario than what was in the comic and makes the characters a bit more complex. It also doesn’t dial back any of the concepts of death (no miraculous resurrection for Bernice) and takes the story down a darker road than what Mirage originally did (yeah, the Saturday morning cartoon version was harder-edged than the Mirage comic version). So I guess I can say that even though this has never been one of my favorite TMNT stories and these have never been my favorite TMNT characters, I can appreciate all the improvements made to the story by Isenburg. So you know what? This episode isn’t half bad. After following Splinter through a dimensional portal, the Turtles find themselves in the Battle Nexus, a place where great warriors from across the multiverse fight each other in a tournament. The Ultimate Daimyo enters the Turtles into the match, but they’re soon caught up in a revenge plot orchestrated by Drako, an old enemy of Splinter’s. So I normally don’t care for tournament arcs and let me tell you why. I was in high school during the big anime fad of the early 2000s, so I watched whatever anime was on like any dumb teenager. And man, it seemed like every Japanese cartoon on TV would inevitably enter into a tournament arc at some point. Dragon Ball (Z), Knights of the Zodiac, Yu Yu Hakusho, and even stuff I didn’t watch, like Pokemon, Ultimate M.U.S.C.L.E. and Yu-Gi-Oh. If it was a Japanese cartoon, you were GOING to get a tournament arc and I just got f----n’ sick of ’em. Though not Japanese, the 4Kids TMNT cartoon came out in the midst of the early ’00s anime fad and when it hit a tournament arc I remember just wanting to pull my hair out. But after rewatching “The Big Brawl” arc some years later, and putting distance between me and the glut of anime tournament arcs that I’d grown sick of, I have to say this is actually one of the best arcs in TMNT’s second season. And maybe even one of the best arcs in the series (certainly one of the most memorable). This opening chapter ties together a number of different plot threads seeded throughout the season. Traximus, who appeared during the “Turtles in Space” arc makes a cameo, as do the Ultimate Daimyo and the Ultimate Ninja from, uh, “The Ultimate Ninja.” There are also additional back story elements about Hamato Yoshi being a Battle Nexus champion and Splinter, upon being mutated, carrying on his family’s participation in the tournament by winning one himself. This arc is a nice culmination of story elements from the season, but without doing something as predictable as yet another showdown with the Shredder. We also get a brief cameo from a young Miyamoto Usagi in the scene where Splinter’s attempted assassination at the hands of Drako is recalled. But since it was such a short moment, I’m going to save my ooh-ing and aah-ing over Usagi until next episode. As for the Battle Nexus, it’s one more of those big contributions to the TMNT mythology that got adapted by other incarnations. The Mirage comic imported it beginning in TMNT (Vol. 4) #25 and the IDW series would take a swing at it years later in TMNT Annual 2014. It’s something of a staple to the franchise, now. And I can see why it’s a popular idea to import. Being a sort of intersection within the multiverse, it lets the Turtles meet a bunch of different aliens and weirdos and even alternate versions of themselves and their ensemble cast. There’s a lot you can do with the place. Yes, even more than just a setting for a fighting tournament. This opening chapter in the arc is all setup, which you’d expect, though it gives us a good idea of who the villains will be. The Ultimate Ninja returns and feigns remorse for his earlier actions, not that anybody believes him. Then there’s Drako, the dragon-guy, and his warriors, a bunch of ninja-phantoms that can meld in and out of shadows. Hey, uh, any of you ever watch Jackie Chan Adventures? Remember Shendu and the Shadowkhan? This is, like, exactly the same thing. Even the same animation studio (Dong Woo). But it’s no biggie; Jackie Chan Adventures was a pretty cool show. As the tournament begins, Leonardo makes friends with the rabbit ronin Miyamoto Usagi. With everyone distracted, the Ultimate Ninja and Drako make their move, poisoning Leonardo with a dart. Miyamoto Usagi of Stan Sakai’s Usagi Yojimbo comic has been an off-and-on recurring TMNT character since almost the very beginning. He first encountered Leonardo in Sakai’s short “Turtle Soup and Rabbit Stew,” though it was just a brief moment of them catching sight of each other. They didn’t have their first battle until Laird’s “The Crossing,”wherein they also became Best Friends Forever and launched a thousand slash-fics. The Turtles and Usagi would crossover several more times in the comics and it’s one of those cases where each crossover would improve upon the previous one. Then Usagi found his way into the original Playmates TMNT toyline (as did his descendant and spin-off character, Space Usagi). That, naturally, led to Usagi making appearances in the 1987 cartoon, which further cemented his relationship with the TMNT. And from there, Usagi has made appearances in the 4Kids cartoon and accompanying toyline, the 2012 Nickelodeon cartoon and its toyline, and even recently encountered the IDW TMNT in their comic. Usagi is a weird case where he is most certainly a guest character, as Sakai has retained rights to him over all these years, but he has met the TMNT so frequently that he’s become a part of their ensemble cast in every generation. We anticipate his presence as much as we do Leatherhead and Rat King, he’s been so thoroughly folded into the TMNT franchise. So his appearance here in the 4Kids cartoon got a lot of fans excited. And this time around, he brought Gennosuke, the rhino-guy from his comic, along with him for the crossover! The 4Kids incarnation of Usagi, of all the ones to appear in the cartoons, I think hews closer to his portrayal in the actual Stan Sakai comics. The Fred Wolf version played him up as an over-the-top Japanese stereotype, obsessed with honor and prone to going into samurai-induced chopping sprees. The most recent Nickelodeon Usagi was really damn cool, but he was perpetually sour-faced and ulta-serious 100% of the time. The Usagi of Sakai’s comic has a sense of light-heartedness and humor to him. His default expression isn’t “blisteringly constipated,” but usually wide-eyed and friendly. He only gets serious when the situation calls for it. The 4Kids Usagi is like that; he’s friendly and approachable but goes into angry-face mode when the fighting starts. While I think all 3 versions of Usagi worked for the shows they appeared in, as I said before, it’s the 4Kids Usagi that feels most authentic to the source material. His toy kinda sucked, though. It was gimmick-driven, where you could wind him up at the waist to make a swirling tornado attack with his swords. But that meant his arms were stuck sticking out to the sides so his default posture was “waddling like a penguin”. Anyhow, the proper Battle Nexus Tournament gets underway and this episode covers the first two rounds. It’s a “brawl” as the episode titles suggest, so multiple pairs square off simultaneously in a divided ring, which means instead of watching one match at a time, we get to flip back and forth between multiple showdowns. Thank God; it REALLY helps move the tournament along. If this were a Japanese cartoon, “The Big Brawl” would last 37 episodes. There are some upsets in the matches, too. Donatello loses to a nobody in the first round. In the second round, Splinter is pitted against Michelangelo and forfeits so that his son can have a chance to compete without him getting in the way. Raph goes up against Traximus and beats him in a pretty solid fight. The only letdown is the battle between Leo and Usagi. As soon as it starts to get good, that’s when the Ultimate Ninja darts Leo, so we don’t get to see who would have really won the battle. Copout! Also, the arc does this weird and stupid thing with Drako. They introduce him in the first episode in a flashback where he tries to assassinate Splinter with his not-Shadowkhan. Then we see the Ultimate Ninja consorting with a humongous mystery-man in a robe… who orders the not-Shadowkhan around… and talks in Drako’s voice. But they won’t say that it’s Drako. It’s supposed to be a surprise. C’mon, 4Kids. Give the toddlers in the audience a LITTLE credit. 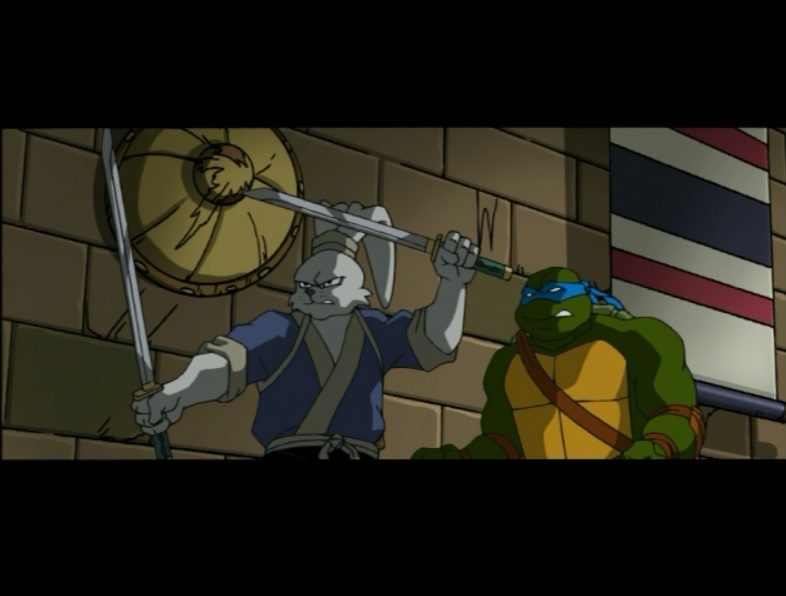 As Raph and Mikey face off in the tournament, and Donnie and Usagi see to Leo’s wounds, the Ultimate Ninja frames Splinter for the attempted assassination of the Daimyo. While I think this installment in “The Big Brawl” had the most drag to it, it’s nothing like what we saw in arcs like “Turtles in Space” so I’m hardly complaining. Usagi gets to hang out with Donnie and they have a pretty good fight with the assassins while trying to protect both the unconscious Leo and the Daimyo. There’s plenty of action to move the story along even if most of the episode feels like a break. The bigger upset is the Raph vs. Mikey match. Truth be told, I love how that one turned out. Mikey puts on a show when he finds out he’s got to fight Raph, acting like a big chicken. But when the fight starts, he knows EXACTLY how to play Raph, getting on his nerves with trash talk and jokes, causing Raph to lose focus and get sloppy. The way he wins is a little suspect, though. Raph runs into a wall and isn’t even knocked out before the Gyoji teleports him to the first aid box where all the losers go. After Raph loses, he drowns his sorrows in a foamy green beverage served in a mug that’s totally “not beer.” We catch up with Traximus, who not-so-subtly sets up the story arc for season 3, explaining how the Federation and the Triceratons have escalated into an all-out war that is threatening the whole galaxy. While he started out as a dull Gladiator parody, Traximus is shaping up to be an okayÂ recurring ally. With Zog dead, the Turtles have to trade up for a new Triceraton buddy. But not a whole lot more to talk about with this episode. There are some dumb scenes, like when the Ultimate Ninja reveals his clever scheme to Splinter while he’s in the dungeon, because he’s a total moron. Or the SPOILER ALERT colossal reveal that the hooded mystery-man was DRAKO all along!! Michelangelo defeats Kluh in the final round of the tournament, but the battle isn’t over. The Ultimate Ninja and Drako make their move against the Turtles, using the Daimyo’s war staff to open a rift in time and space. The fight with the assassins to protect the Daimyo drags on from last episode and into this one. You can definitely see that this is where the writers had to stretch things to fill four episodes. But the action is very nicely animated; perhaps because this was the season finale, the budget got something of a boost to give the visuals a big finish. Mikey defeating the hulking Kluh to win the tournament was another cheat on his end, as Drako interrupts the match halfway through and Kluh is mostly worn down trying to stay alive when the time-space rift opens, not so much anything to do with Mikey (though he does accidentally inflict the finishing blow). What’s cool is that Mikey blundering his way to being Battle Nexus Champion wasn’t a matter of accidental storytelling; there’ll be an episode later on that addresses whether he truly earned his victory. But until then, he’s going to be REALLY obnoxious about it in episodes to come. The ending feels like something straight out of the Fred Wolf TMNT cartoon. A dimensional portal gets opened up and the bad guys get sucked inside, conveniently eliminating their threat (or momentarily waylaying them until they make a comeback). It’s kind of nostalgic, I guess, though a somewhat lackluster way to end this arc. But as with Mikey’s kinda-sorta-win, what happens to the Ultimate Ninja and Drako at the end of this episode will set up an arc to come, so there’s a point to it. Usagi takes a backseat throughout much of this finale. In fact, he’s only been a supporting cast member through most of “The Big Brawl”. The arc that introduces him into the 4Kids series isn’t actually ABOUT him, and while he gets to tag along, he’s never the focus. It’s a sharp contrast to his appearances in the Fred Wolf and Nickelodeon shows, where it was a big production and he remained central to the plot lines of each story. In a way, I kind of like this take. Usagi is introduced as a passerby whose adventures intersect with the Turtles, but the universe isn’t necessarily revolving around him. What’s great about the 4Kids cartoon and their use of Usagi is that they actually USE Usagi. He’ll appear several more times in the series, both in stories where he’s just a bystander and in stories where he’s in the spotlight. It makes him feel more integrated, like he’s a regular part of the rotating cast and not just a special guest. As for Gennosuke, his inclusion was fun but he doesn’t really do much. If you’re a fan of the Usagi Yojimbo comics then he seems more like a bone thrown your way than anything relevant to the plot of the storyline. He’ll tag along with Usagi in future episodes of the 4Kids series and he’ll get more to do in those installments. I like the guy, but it’s a case of me liking him more for his history in the comic than for his participation in this show. And maaaaan do they butcher all the Japanese names in these episodes. It’s funny, because the Fred Wolf cartoon messed up the pronunciation of Usagi’s name as “You-Soggy”, but then the 4Kids show screws up the other half of his name by pronouncing it as “Miya-Motto”. Then there’s “Gennosku” which they just splatter all over the place. Susan Blu really should’ve consulted a dialect coach before directing the dialogue for this episode. “The Big Brawl” was pretty good. There’s only a tiny bit of drag between parts 3 and 4, but it opens up a lot of storytelling avenues for the series and integrates several continuity elements from past episodes. Season 2 in general was something of a dip in quality for the series, but not into “bad” territory. Just “not as good” territory. The “Turtles in Space” arc ran too long, “City at War” wasn’t so hot and many of the standalone episode stunk out loud, but altogether it has a lot of good content to offer. And “The Big Brawl” is certainly a season highlight, up there with “Secret Origins” and “Rogue in the House”. Next up is season 3. It opens with a pretty drawn-out 6-parter (actually two consecutive 3-parters), but I recall that season having some of the show’s BEST standalone installments later on. Also, the introduction of the best villain in the entire 4Kids series: Agent Bishop.